Cow’s milk allergy (CMA) is a complex and often misunderstood disorder. 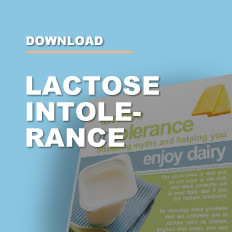 The general public frequently confuses CMA and lactose intolerance. A true food allergy occurs when there is an abnormal reaction of the immune system to one or more proteins present in food. This type of reaction results in the formation of antibodies, which can trigger immediate symptoms. Food intolerance is different from a food allergy and does not involve the immune system. It occurs when a person has an enzyme deficiency or experiences a non­immune reaction to either natural or artificial substances in foods. 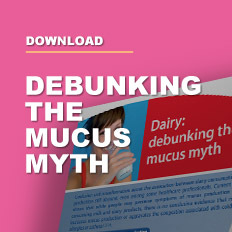 • CMA is an inflammatory response to milk proteins and is distinct from lactose intolerance. • CMA is more prevalent in infants (2–6%) than in adults (0.1–0.5%) and the dominant immunological factors driving allergic reactions change with age. 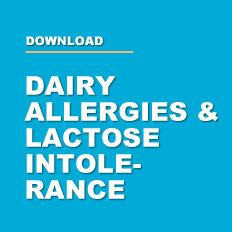 • The prevalence of self-diagnosed CMA and lactose intolerance in the community is substantially higher than the incidence reported in blinded and controlled challenge trials, suggesting that a proportion of the population is unnecessarily eliminating dairy products. • Breastfeeding is the best preventative strategy for preventing CMA, although it cannot eliminate the risk of allergic sensitisation in infants. • Management of CMA involves avoidance of dairy products for the duration of the condition. Appropriate nutritional advice is therefore important to prevent nutritional deficiencies. Lactose is a carbohydrate that is found naturally in mammalian milk and is hydrolysed by the enzyme lactase in the small intestine. When digested, lactose is split into two smaller sugars, namely glucose and galactose. 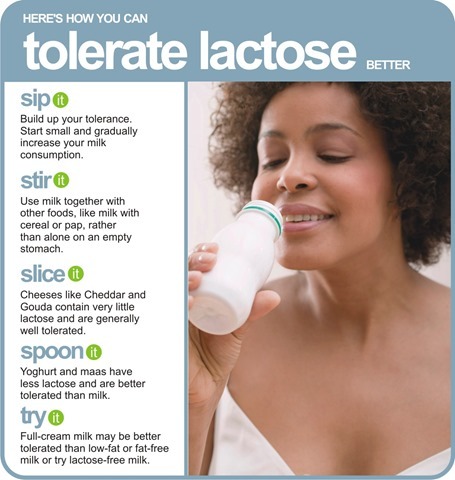 When someone has insufficient lactase to break down all the ingested lactose, they are said to be lactose intolerant. The undigested lactose passes through the small intestine to the colon, where naturally occurring bacteria ferment the lactose and produce acids and gas. The consumption of quantities greater than 12 g lactose (the amount typically found in 250 ml milk) may result in symptoms that include abdominal pain, bloating, flatulence, cramps and diarrhoea. Lactase activity declines exponentially around weaning (introduction of solids) to about 10% of the neonatal value. Even in adults who retain a high level of lactase, the quantity of lactase is about half of that of other enzymes that digest sugars. 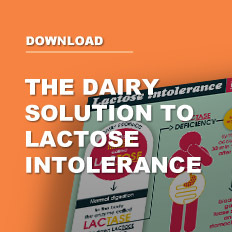 The level of lactase present in the small intestine, the dose of lactose consumed from food and other products and the conditions under which it is consumed all affect an individual’s level of tolerance. The tendency to produce less lactase with age is more common in people of Asian, southern European and African heritage. Temporary lactose intolerance may occur as a response to malnutrition or gastrointestinal infections, or after surgery. In South Africa the true prevalence of CMA is hard to ascertain. It is believed that 2% of children under the age of two years are truly allergic to cow’s milk, and in adults CMA is rare. 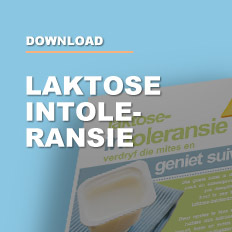 The prevalence of lactose intolerance in South Africa is estimated at 11.03%. Once an allergy has been diagnosed by a qualified health professional, the offending food(s) should be eliminated from the diet. Even trace amounts can cause severe symptoms. 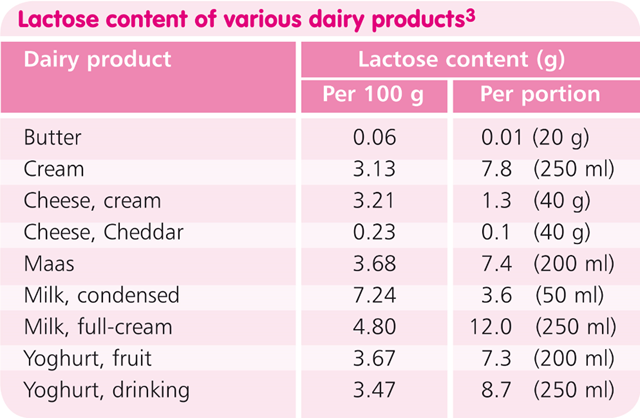 So, if cow’s milk protein is the problem, avoid all milk and dairy products, e.g. milk, cheese, yoghurt, butter, ghee, ice cream, buttermilk, cultured milk, milkshakes and flavoured milk. Read all food labels to check for ingredients such as milk, milk powder, milk solids, casein and whey. CMA persists in only a minority of children. The prognosis depends on the patient’s age and specific IgE count at the time of diagnosis. The overall remission rate is approximately 45–50% at one year of age, 60–75% at two years of age, 85–90% at three years of age, 92% between five and ten years of age, and 97% at 17 years of age. Infants with CMA should be re­examined regularly by their doctor and dietitian. Periodic rechallenges should be conducted to monitor tolerance (every six to 12 months). 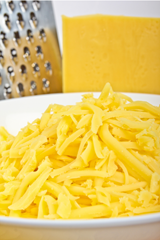 In case of IgE­mediated CMA, milk­specific IgE levels should also be monitored periodically. Declining levels of specific IgE correlate well with development of tolerance to foods. A specific IgE level for milk protein of 2 ku/ℓ predicts a 50% chance of passing a challenge test. Recent research shows that placing small amounts of milk under the tongues of children who are allergic to milk can help them overcome their milk allergies. This approach, known as SLIT (sublingual immune therapy), involves giving children small but increasingly higher doses of the food they are allergic to until their immune systems ‘learn’ to tolerate the food without triggering an allergic reaction or only mild symptoms. A similar approach known as oral immunotherapy can also successfully treat children with milk allergies. 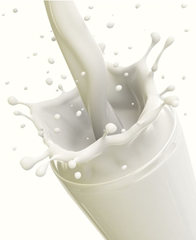 Unlike SLIT, oral immunotherapy involves consuming milk protein rather than merely placing it under the tongue. Researchers caution that both therapies can lead to violent allergic reactions in some patients and should always be done with a doctor’s supervision. In the past, delaying the introduction of dairy until at least one year of age was considered a suitable strategy for timely introduction of potential food allergens. However, recent studies indicate that in the case of complementary feeding, it might be in the infant’s best interest to introduce dairy earlier rather than later to prevent allergies. Introduction should, however, not be before 17 weeks of age, but at least challenged in the diet before 24 weeks. According to the US National Institute of Health (NIH), complete avoidance of milk and dairy products is unnecessary in most cases of lactose intolerance. No treatment can improve the body’s ability to produce lactase, but symptoms can be controlled through diet. Research shows that people with self­perceived lactose intolerance may be at risk of poor bone health and higher rates of diabetes and hypertension because of lower calcium intakes. The health benefits associated with calcium in dairy may not necessarily translate to equivalent efficacy in another food item or supplement, since variable factors influence the biological response to a bioactive component, such as the nature of the food matrix. Milk provides an easily accessible matrix, has a simple digestible protein with a balanced amino acid profile and is rich in a large variety of essential nutrients. The latter observation is corroborated by the 2005 US Dietary Guidelines for Americans, which concluded that in addition to calcium dairy contributes more than 10% of the required riboflavin, vitamin B12, phosphorus, magnesium, zinc, potassium, protein and carbohydrate. Studies also show that the specific combination of calcium, phosphorus and protein makes the dairy matrix an almost indispensible part of the diet to build and maintain strong bones. Other health benefits beyond bone health include cardiovascular health, weight control, positive outcomes on metabolic syndrome and hypertension. 1. Ross GC & Bennett LE. 2005. J Am Coll Nutr. 24(6): 582S­591S. 2. Motala C. 2007. Sa Ped Rev. 4(4): 13­23. 3. Dairy Australia. 2008. Food Allergy. Available at www.dairyaustralia.com. 4. Mahan KL & Escott­Stump S. 2000. Food Nutrition & Diet Therapy. 10th ed. Saunders. Philadelphia. 5. Motala C. 2011. CME. 29(1): 30­34. 6. Patriarca G et al. 2008. IEM. 4(1): 11–24. doi: 10.1007/s11739­008­0183­6. 7. National Dairy Council. 2010. Dairy Council Digest. 81(1): 1­6. 8. Nicklas TA et al. 2011. Am J Clin Nutr. doi:10.3945/ajcn.110.009860. 9. Lomer MC, Parkes GC et al. 2008. Aliment Pharmacol Ther. 27(2): 93­103. 10. Bhatnagar S & Aggarwal R. 2007. BMJ. 334(7608): 1331­1332. 11. Statistics by Country. 2003. Available at www.cureresearch.com/stats­country.htm. 12. Sinagra JL, Bordignon V et al. 2007. Pediatr Dermatol. 24(1): 1­6. 13. Businco L, Bruno G et al. 1999. Acta Paediatr Suppl. 88(430): 104­109. 14. Keet CA et al. 2009. American Academy of Allergy, Asthma & Immunology annual meeting. Washington DC. 132(2). 15. Edmond KM et al. 2006. J Ped. 117(3): e380­386. 16. NIH Consensus Development Conference. 2010. 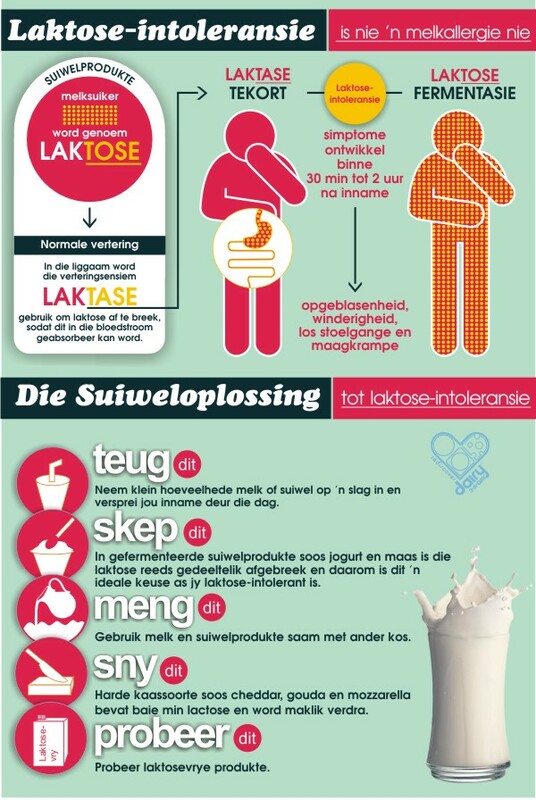 Lactose Intolerance & Health. Bethesda. Maryland. 17. Montalto M, Curigliano V et al. 2006. World J Gastroentero. 12(2): 187­191. 18. Steijns JM. 2008. Int Dairy J. 18: 425­435.